Plato (428/427 BC – 348/347 BC) was an ancient Greek philosopher, the second of the great trio of ancient Greeks –succeeding Socrates and preceding Aristotle– who between them laid the philosophical foundations of Western culture. Plato was a student of Socrates and deeply influenced by his teacher's unjust execution. Karl Popper’s The Open Society and Its Enemies is the most serious sustained critique of Plato’s totalitarian tendencies. 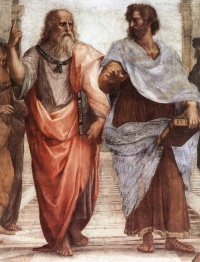 The precise relationship between Plato and Socrates remains an area of contention among scholars. Plato makes it clear, especially in his Apology of Socrates, that he was Socrates' most devoted young follower. In that dialogue, Socrates is presented as mentioning Plato by name as one of those youths close enough to him to have been corrupted, if he were in fact guilty of corrupting the youth, and questioning why their fathers and brothers did not step forward to testify against him if he was indeed guilty of such a crime (33d-34a). Later, Plato is mentioned along with Crito, Critobolus, and Apollodorus as offering to pay a fine of 30 minas on Socrates' behalf, in lieu of the death penalty proposed by Meletus (38b). In the Phaedo, the title character lists those who were in attendance at the prison on Socrates' last day, explaining Plato's absence by saying, "Plato was ill" (Phaedo 59b). Plato never speaks in his own voice in his dialogues. In the Second Letter, it says, "no writing of Plato exists or ever will exist, but those now said to be his are those of a Socrates become beautiful and new" (341c); if the Letter is Plato's, the final qualification seems to call into question the dialogues' historical fidelity. In any case, Xenophon and Aristophanes seem to present a somewhat different portrait of Socrates than Plato paints. Some have called attention to the problem of taking Plato's Socrates to be his mouthpiece, given Socrates' reputation for irony. Aristotle attributes a different doctrine with respect to the ideas to Plato and Socrates (Metaphysics 987b1–11). Putting it in a nutshell, Aristotle merely suggests that his idea of forms can be discovered through investigation of the natural world, unlike Plato's Forms that exist beyond and outside the ordinary range of human understanding. "For heaven's sake, do not throw Plato at me. I am a complete skeptic about Plato. . . . Plato is boring. In the end, my mistrust of Plato goes deep: he represents such an aberration from all the basic instincts of the Hellene, is so moralistic, so pre-existently Christian--he already takes the concept 'good' for the highest concept--that for the whole phenomenon Plato I would sooner use the harsh phrase 'higher swindle,' or, if it sounds better, 'idealism,' than any other." Nietzsche in Twilight of the Idols. Productive, which represents the abdomen. (Workers) — the labourers, carpenters, plumbers, masons, merchants, farmers, ranchers, etc. These correspond to the "appetite" part of the soul. Protective, which represents the chest. (Warriors or Guardians) — those who are adventurous, strong and brave; in the armed forces. These correspond to the "spirit" part of the soul. Governing, which represents the head. (Rulers or Philosopher Kings) — those who are intelligent, rational, self-controlled, in love with wisdom, well suited to make decisions for the community. These correspond to the "reason" part of the soul and are very few. Wherein it concerns states and rulers, Plato has made interesting arguments. For instance he asks which is better—a bad democracy or a country reigned by a tyrant. He argues that it is better to be ruled by a bad tyrant, than be a bad democracy (since here all the people are now responsible for such actions, rather than one individual committing many bad deeds.) This is emphasised within the Republic as Plato describes the event of mutiny onboard a ship. Plato suggests the ships crew to be in line with the democratic rule of many and the captain, although inhibited through ailments, the tyrant. Plato's description of this event is parallel to that of democracy within the state and the inherent problems that arise. The Theory of Forms typically refers to the belief expressed by Socrates in some of Plato's dialogues, that the material world as it seems to us is not the real world, but only an image or copy of the real world. Socrates spoke of forms in formulating a solution to the problem of universals. The forms, according to Socrates, are roughly speaking archetypes or abstract representations of the many types of things, and properties we feel and see around us, that can only be perceived by reason; (that is, they are universals). In other words, Socrates sometimes seems to recognise two worlds: the apparent world which is constantly changing, and an unchanging and unseen world of forms, which may perhaps be a cause of what is apparent. Unless indicated otherwise, the text in this article is either based on Wikipedia article "Plato" or another language Wikipedia page thereof used under the terms of the GNU Free Documentation License; or on original research by Jahsonic and friends. See Art and Popular Culture's copyright notice. This page was last modified 19:01, 29 January 2019.